Do you like a nutritious and tasty breakfast but need something easy? 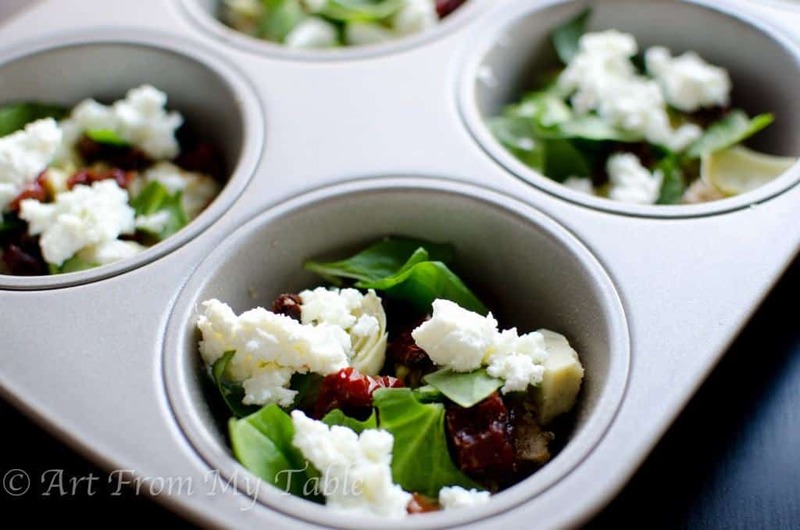 Spinach Artichoke Sun Dried Tomato Mini Frittatas is your answer! Fluffy eggs, with gooey cheese and flavorful veggies. You’ll want this for breakfast, lunch, AND dinner! Mornings can be a little crazy at times, I get it. It’s so much easier to pour a bowl of cereal than it is to cook something. The thing with cereal, is it just doesn’t ‘stick’ for long. I find my kids (and I) are hungry again, quite soon. And let’s face it, most cereals just don’t have a ton of nutritional value, especially the kind kids like. That’s why I love these mini frittatas. Actually, I just love eggs. We go through dozens of eggs here, literally. Eggs are highly nutritious, plus there’s a plethora of ways to cook them. Scrambled, fried, poached, hard-boiled, etc. 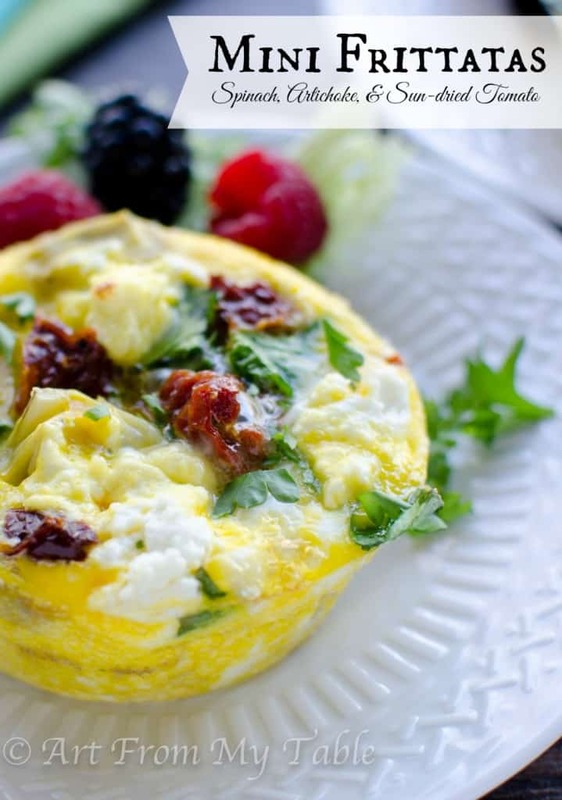 But back to the spinach artichoke sun dried tomato mini frittata–the best part about these is you can make them ahead! Spend a half hour on the weekend putting these together and you’re set for the week. Now, I realize this particular recipe has more ‘grown up’ ingredients in it. Please don’t let that scare you. This recipe is extremely versatile. You can change out the veggies for any fillings you prefer. I’ll share some variations at the end of the post. Spinach Artichoke Sun Dried Tomato Mini Frittatas is a wonderful choice for a Mother’s day or Easter brunch! Breakfast in bed anyone? 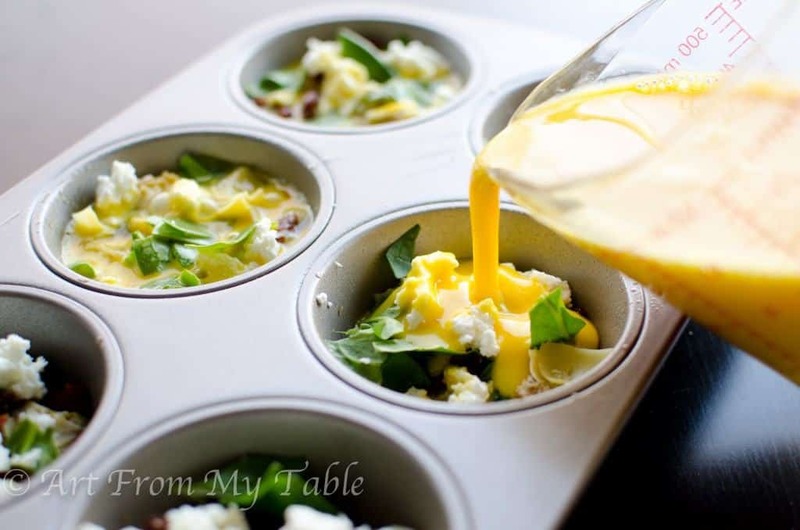 fluffy eggs, gooey cheese and flavorful vegetables baked up in a muffin tin for individual servings. Grease the muffin tin, I use an olive oil spray. 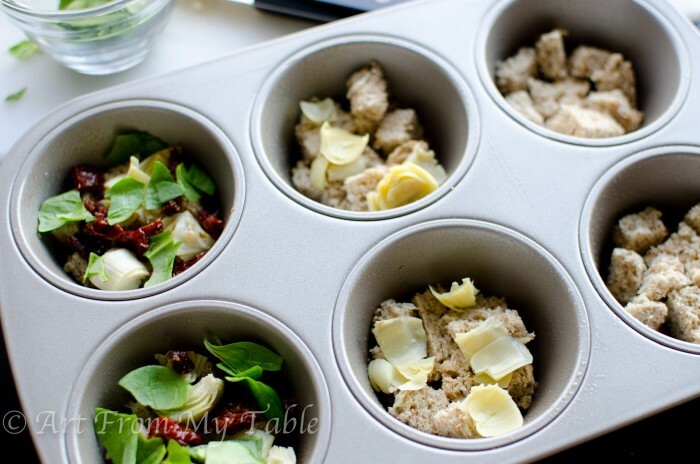 Cover the bottom of each muffin tin with the cubes of bread. Layer the artichoke hearts, sun dried tomatoes, spinach, and cheese. In a bowl, beat the eggs and milk together. Transfer to a measuring cup for easy pouring. Pour the egg mixture into the muffin tin until about 2/3 full. Bake for 15-20 minutes or until just set. For make ahead method, allow to cool and store in an airtight container in the refrigerator for warming up and serving later. I used this jumbo muffin tin, so it made 6 jumbo frittatas. In a regular muffin tin, you’ll get 12. I’m sure you can think of a million other combinations! Enjoy! Love eggs? 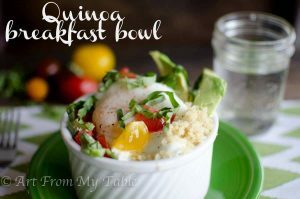 You’ve got to try Quinoa Breakfast Bowls! I can’t get enough of these!! Oh, this is totally my kind of breakfast recipe! And like you, I’m a huge fan of eggs! 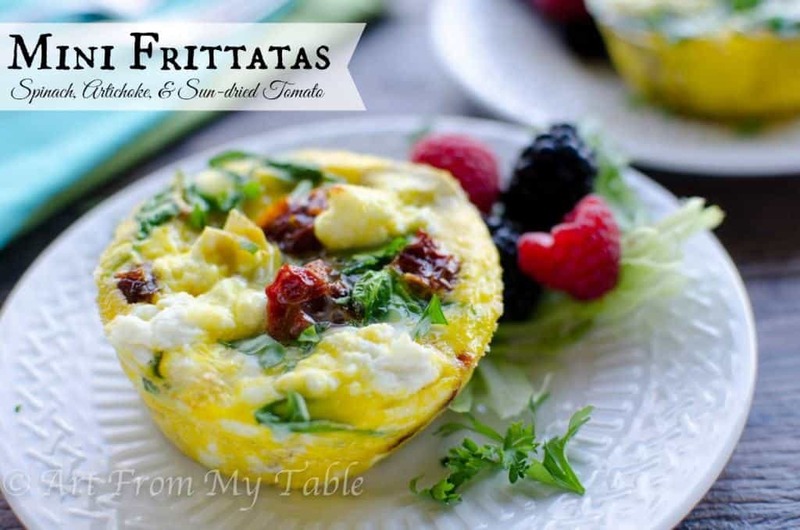 Pinned, and hope to try these gorgeous mini frittatas soon! Thanks Ginger! Check back with me and let me know how you like it!! 🙂 I’m picking up 7 dozen eggs from my ‘egg lady’ tomorrow! This looks so delicious! Thanks for sharing at Artsy-Fartsy Link Party. These are amazing! Thanks for linking up with What’s Cookin’ Wednesday! This looks wonderful! Love spinach and artichoke. Is that Demarle at home I see?? These look so appetizing and delicious.